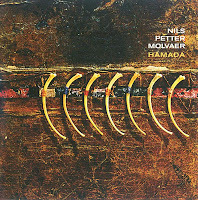 Norwegian trumpeter Nils Petter Molvær deserves the credit for renewing jazz by going beyond fusion, to a more sophisticated musical environment with electronics and sampling. I have always liked, and still like, his earlier work with Khmer, but then he manoeuvred himself into a dead end street, repeating himself over and over again in trumpet atmospherics, which are by themselves nice as background music, nonintrusive but also not very expressive, nor especially rich musically. 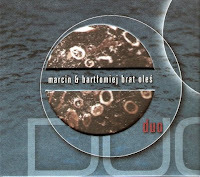 On this album his main sparring partner is guitarist Eivind Aarset who also does some programming, and on two tracks Audun Erlien joins on bass and Audun Kleive on drums. Sampling specialist Jan Bang adds his material on three tracks. This album is a little calmer than some of his previous recordings, and only two pieces, "Friction" and "Cruel Altitude", have the energy and drive of his early work. All the other pieces are nice and sweet with long trumpet phrases of a landscape of electronics and guitar. It's still nice, but it's also time for further explorations. 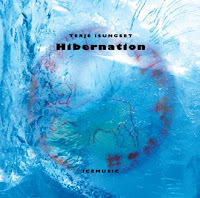 Terje Isungset, the "Ice Man" from Norway, has carved out his own style of music, anchored in traditional music, tribal in nature, but free as the wind. With Hibernation, he moves his music even further into regions of greater purity and authenticity, limiting the instruments even more, to ice percussion and ice horn, with the vocals of Sara Marielle Gaup. It all sounds so unbelievably fresh, authentic and pristine, with a naiveness and sense of wonder that is almost childlike, but at the same time also spiritual, devoid of any burdens that weigh on the soul. There is no direction to the music, it seems to arise spontaneously, calm and almost natural, without any sense of urgency. As a Norwegian critic put it "ice cold and so much warmth", which is possibly the best description of the music. Listen to an excerpt from "Starlit"
Buy or download from Maquismusic or eMusic. "We Sleep in a Rabbit Hole". No doubt about it, these guys are not taking us for a stroll in the park, but they take us deep into primal musical experience of sounds clashing with one another, driven by pure energy, engaging in wild interactions. The music is surely not for the faint of heart, but the coherence of the approach, the depth and wealth of the interactions open up possibilities for music, and offering the listener a quite unique listening experience. Listen to an excerpt from "We Boil The Raven's Skull Into Gold"
Buy or download from ESP. 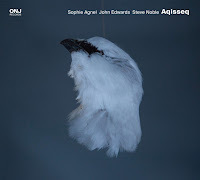 Here's another nice album in John Zorn's Filmworks series. With his top performers Marc Ribot on guitar, Rob Burger on accordion and piano, Kenny Wollesen on marimba and drums, and Greg Cohen on bass. 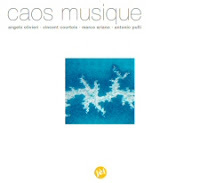 The pieces are atmospheric, with a Latin influence, but then more in sound than in rhythm (except for "Besos De Sangre"), with the piano, the marimba and the electric guitar creating a fine and unusual soft combination. The themes are quite repetitive, like you would expect from film scores, with not too much difference between the calm and unobtrusive tracks. As with many of Zorn's compositions, the tunes are sweet and accessible, but with a dark and nasty undertone at times. 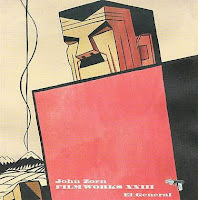 The album was intended as the score for a documentary about Plutarco Elias Calles, one-time dictator of Mexico, "who was called everything from a nunburner to the father of modern Mexico", yet apparently only three tracks were actually used in the film. It's always a pleasure to hear these four musicians play, and regardless of the subgenre, they usually have something new to bring as they do here. Nice, but not essential. Listen to an excerpt from "Recuerdos"
Regular readers of this blog will know my apprecation of Tony Malaby, and on this album he demonstrates again what a wonderful musician he is : technically brilliant, capable of many sounds on his tenor, from beautiful warm melodic sounds to unusual exploratory expressivity, he is at the same time a true artist, creating music that borrows from the known yet moves it into a different kind of perspective, making it rich, deeply felt as well as intellectually stimulating music. On Paloma Recio he is joined by three other brilliant instrumentalists: Ben Monder on guitar, Eivind Opsvik on bass and Nasheet Waits on drums. Their music is often soft, restrained, precise and full of tension, although there are moments when the tension gets unleashed, as on the long "Loud Dove", the translation of the album's title. In contrast to his superb "Tamarindo", there is more compositional structure to be found on this one, even clear themes, but the beauty lies in how the four musicians interact around those themes, creating shifting environments in which the melody flourishes, both rhythmically and harmonically. Sure, some of these must have been premeditated and even rehearsed, but the quality of the playing is of the kind that cannot be captured in musical scores. It's like with modern painting: the real attraction is not in the lines, but in what lies between them, the implicit quality of space, color, contrast, pace, and openness, offers a more powerful listening experience than any in-your-face melody and rhythm. The end result is a relatively accessible album, with a strong musical vision and powerful execution. Great! Listen to an excerpt from "Lucedes"
I have rarely heard a live CD that starts so powerful as this one. After a short intro, the whole band dives in full throttle, no holds barred, full of energy and drive, full of self-confidence and without hesitations, slow-downs or any other deviations: onward and forward, no matter what. The train driver is Dave Rempis, on tenor on this piece, with Anton Hatwich on bass and with the double drums of Tim Daisy and Frank Rosaly. After six minutes Rempis shuts up and leaves his locomotive in the hands of the rhythm section, full speed, onward and forward, and when Rempis re-joins, what started as a boppish tune, now swirls into full swing, with his expressive horn borrowing from tradition in a wild rollercoaster of a free solo, relentlessly, keeping up the powerplay without slacking down, but then yes, it comes to a halt, unavoidably, after eighteen minutes of madness. On the second piece, Rempis switches to alto, for a piece which is the exact opposite of the first one, slow, sensitive and calm, first solo, then joined by arco bass and gently the percussion enters the tune as well. The third piece starts with polyrhythmic drums, for a free form piece, more abstract, totally unpredictable, and it is only after about ten minutes that a steady vamp gets going, giving the tune a more traditional foundation for the music's development, yet it slows down into a quite kind of intermezzo, with the four musicians softly bouncing off ideas, gently, sensitively, slowly gathering volume, and speed, ending the tune again in a paroxysm of sound, to the general satisfaction of Alchemia's enthusiastic audience. 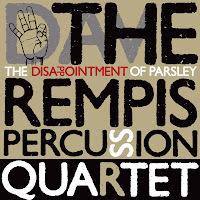 Listen to an excerpt from "The Disappointment Of Parsley"
Sing Sing Penelope is a Polish "post-jazz" band, established in 2001 by musicians playing in jazz, avant-garde and rock groups. For this album they have trumpeter Andrzej "Major" Przybielski as their guest of honor. The latter is a kind of popular figure in Polish jazz, having played with all kinds of bands, in all kinds of settings, from traditional big band to free and avant-garde jazz, yet without having released any record as a leader. 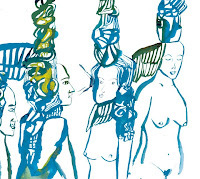 Sing Sing Penelope consists of Tomasz Glazik on saxophone and synthesizer, Wojciech Jachna on trumpet and flugelhorn, Rafal Gorzycki on drums, Daniel Mackiewicz on electric piano, synthesizer, organ and percussion, and Patryk Weclawek on bass. The music is hard to describe. Influences range all over the place, think of splintered sound of the electric Miles mixed with the psychedelia of the early Pink Floyd (the organ! the synth! ), joined by the melancholy of Tomasz Stanko (especially on Hosanna SSP), and added to that a freewheeling modern jazz touch, all sweet with a little sharp edge. Clever, inspiring and beautiful music. Listen to an excerpt from "Stirli People". Listen and buy from Monotype Records. With the first notes of this record, you can hear that Ornette Coleman is not far, or at least that Don Cherry is not far. I've been racking my brain to find the exact spot where Cherry plays the phrase that is used as the theme of the first piece "Blues If It Is", I can hear it, with Haden's arco bass in accompaniement, but only in my head. I will share the track below and will thank the reader who can find it for me. Anyway, the band is called Search and consists of RJ Avallone on trumpet and wooden flutes, Matthew Maley on tenor saxophone and clarinets, David Moss on bass, and Bryson Kern on drums. I like the emotional opening track, the middle-eastern flavor of "Herds", the second piece, the openness of "Next", the joyous theme of "Joujouka", the dark theme of "Day Terrors", but then some of the other tracks, especially the more boppish ones, are all too familiar and predictable, going back to the early free jazz of the 60s without adding much. In search of the Don Cherry phrase in my head, I listened again to the best Ornette Coleman Quartet, i.e. "Old & New Dreams", the band that played his music but without the master himself, and to me still one of the best bands ever. It all still sounds so fresh, so joyful, so deep, so creative, and I know, it's unfair to compare this band to them, but the difference is of course huge. 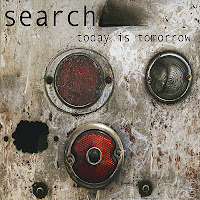 "Search" has the skills, both in the compositions and in playing the instruments, but this band could do themselves a big favor by indeed looking at tomorrow, and to get rid of the past. Create your own voice, guys. Even more. Very promising debut. Listen to "Blues If It Is"
For their third duo recording, Canadian saxophonist François Carrier and drummer Michel Lambert, play no less than twenty short improvised pieces, varying between 44 seconds and 6 minutes. 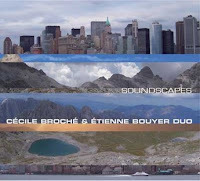 In stark contrast to most other releases by Creative Sources, the music is relatively accessible, there is melody and rhythm, even implicitly, as opposed to the "organised sounds" that the label is better known for. The two musicians keep delving deeper into the essence of music, delivering their little miniatures with an immediacy and authenticity which also characterized their latest albums. The effort makes the music go away from the long Coltrane-like expansiveness that Carrier used in his live performances, yet transforming the spirituality into the more compact form, somewhat analogous to the short Japanese "haiku" verses. The music is indeed not epic anymore, it's poetry. Even in the wildest and most expressive pieces, lyricism and subtlety are omnipresent. 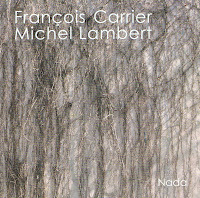 There are moments when Carrier sounds like Dewey Redman, both in his warm tone and melodic phrasing, and Lambert is, well, himself, creative and light of touch. 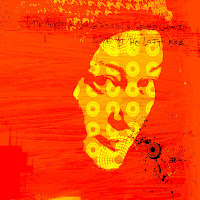 The shortness of the tracks also forces the two musicians to focus on the tunes' essence: a feeling, a sound, a rhythm. Creating it, wondering at it, playing around it, and closing it. But each piece has a story to tell, giving impressions from nature, and expressing a reaction to it, whether serene, as in "Growing", sad, as in "Tabula Rasa", or distressed, as in "Transformation", joyful, as in "Clouds" or "Unknown". The sound itself is very organic, with notes and rhythms growing out of their predecessors, quite naturally, without pretence, without a clear plan, yet definitely part of the same piece, and beautifully. The sound of life. Again, a great album. 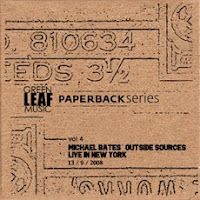 When I heard Michael Bates' debut album in 2003, I was thrilled by his specific approach: not too far left from the mainstream, which makes his music quite accessible, yet sufficiently adventurous and creative to surprise the listener, to add little ideas, integrate elements from the jazz tradition but also from other genres such as modern classical and folk music, and then twist them into something new, but then in a very intelligent and sensitive way. Over the years, his band, "Outside Sources", with Russ Johnson on trumpet, Quinsin Nachoff on sax, and Jeff Davis on drums, has even become better, and this live date, recorded at a performance at the Cornelia Street Café in New York this past September is really great. The "live" aspect is not really dominant: you hear the audience only once at the end (except for some clattering cutlery during Bates' bass solo on "Simple Interlude"), but the directness of the performance, the little emotional extra that deepens the sounds, both on the wild as the slow moments, is typical of a live date. 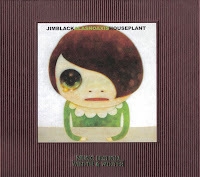 The two opening tracks "Bloodletting", and "Russian School", come from his latest album "Clockwise", together with three other tracks "Machinery", "Fellini" and "Damasa". Not only are Bates' compositions exceptionally good, so is the band. Russ Johnson and Jeff Davis are their ususal excellent selves, as is Bates, and I think this is saxophonist Quinsin Nachoff's best performance with the band so far. Only two tracks are new, and although the performance is good, the pieces do not differ all that much from the studio recordings. So, if you don't have anything from this band yet, this album will make an excellent introduction. If you already have Clockwise, you must really have loved it, to buy it again in a live version. Listen to an excerpt from "Lucifer", one of the new pieces. Buy or download from Greenleaf. Download directly from the musicians. Listen to an excerpt from "Skrik"
... reached tonight in a little over two years. 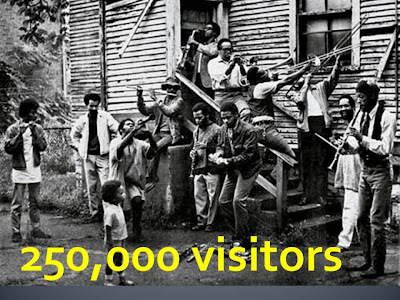 Thank you visitors for the interest. I hope it benefits the music and the musicians! 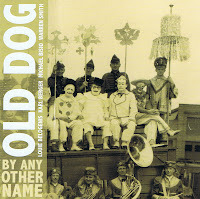 This is the first release by Old Dog, an appropriate name for a band consisting of veteran jazz musicians, with Karl Berger on vibes and piano, Louie Belogenis on tenor, Michael Bisio on bass and Warren Smith on drums. Well, they're not that old, really, and certainly not when you listen to them play. The music has drive, vigor, adventurousness and wonderful expressivity. 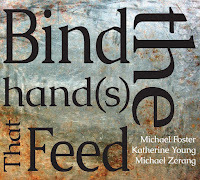 Half the compositions are penned by Michael Bisio, who is extremely prolific these days - this is my fourth review in which he figures this year - and his title song bookends the album, once in a trio format, and ending with the quartet. His compositions are freebop, with clear theme and rhythm, and they alternate with more open quartet improvisations. The improvisations are equally excellent. "Endless Return" has a coltranesque spiritual expansiveness, a steady bass vamp, repetitive piano chords and a soaring sax. "Who Are You?" offers the other end of the scale of free form: less epic, more intimate, more human. The longest piece, "Constellation", brings a mixture of both, with Berger playing a leading role on piano and vibes. But the real highlight is Bisio's title track "By Any Other Means": sensitive, rich and deep. These are four musicians who are underevaluated and underexposed. Belogenis has profiled himself more as a leader in the past years, but then with changing line-ups and band names, which does not really help to get wide recognition. Smith has also contributed to some of the better albums and performances of the last years, but again in all modesty. Karl Berger has been almost invisible in the past decades. Bisio has been more prominent lately, but still, the public awareness of these musicians is inversely proportional to their skills and value. Listen to an excerpt from "Who Are You?" Listen and buy from Porter Records. 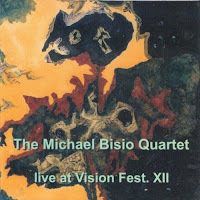 Recorded at the New York Vision Festival in June 2007, this album brings a performance by the Michael Bisio Quartet, led by the great bassist, with Stephen Gauci on tenor, Avram Fefer on tenor and soprano, and Jay Rosen on drums, and to my knowledge this is only the third release of the band, after their CIMP albums "Connections" and "Circle This" . In line with the Festival's positioning, the music is free, wild, driven by a muscular sensitivity, with emotional outbursts, velvet tonal subtleties, and more contemplative moments. None of the material is new, "Hystory Of A Mystery", figures on "Connections", and also on the recent trio with Bob Gluck, and "Nitro, Don't Leave Without It", comes from "Circle This", but that's fine of course, because the quality of the music is more in the performance than in the composition itself. The two pieces are a little over twenty minutes each, giving the musicians ample time to explore and expand the tune, to move it through various layers of intensity and momentum. They can do it all, and they do it all, from the wild all-hell-breaks-loose powerplay to the quiet fragile solo moments, with in between the perfect unison themes. And it must be said, the quartet's expansive quality music has that extra touch in a live performance, not only because of the length of the pieces, but clearly for its much more emotional directness. 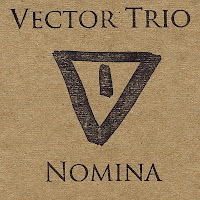 The chances that you ever heard a trumpet-bass-drums trio that sounded like the Vector Trio, are close to nil, because they bring music into new realms. 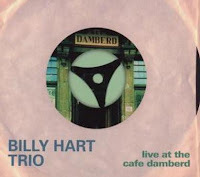 The band consists of Scott Forrey on trumpet, electronics and percussion, Gary Rouzer on bass, bass cello, loops and electronics, and Marshall Hughey on drums and landscape percussion. Totally improvised and highly rhythmic but with (un)clear structure, often repetitive themes, electronic enhancement and distortion, this is music that will please younger audiences too. It is a kind of the-electric-Miles-goes-trip-hop-in-a-cloud-of-noise. It is dark, violent at times, raw, yet strangely attractive too. The good thing about it is that it has its own unmistakable approach. These guys developed an interesting angle to music. They surely have a story to tell. And it's not all violent and abrasive, even in the quieter parts they manage to capture and maintain attention. And keep the same unity of musical vision. Stubbornly. Uncompromisingly. That unity is helped by the similarity of the some of the trumpet phrases in the various pieces, which gives it a kind of suite-like feel and flow. 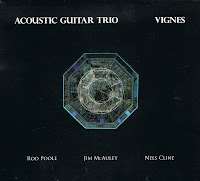 And when the electronics slow down for a minute, and acoustic voices can be heard, it is also clear that these three musicians know how to play their instruments, also without tricks and effects. Not bad, not bad at all. Listen to an excerpt from "Synochus". 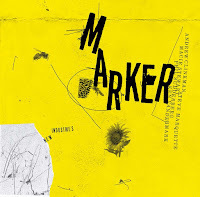 This is the second release by Danish saxophonist Lotte Anker with her trio with Craig Taborn on piano and Gerald Cleaver on drums. The concept that started on the first album, "Tryptich", comes to fruition on this live date, and takes the concept a notch higher. 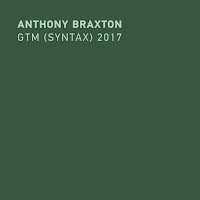 Gone are the high-toned nervousness, and some of the density of the improvisations, making room for slower, warmer, more deeply felt and opener structures, and it works to perfection. Anker delves deep into the nature of music, stripping it of all its mannerisms, patterns and clear melodic lines, revealing a subtle, sensitive, melodic emotional nakedness, fragile and beautiful, intense and heartfelt. 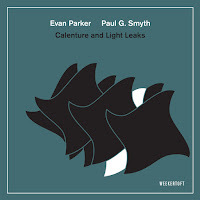 Taborn and Cleaver provide the ideal support and interaction, enjoying the subtleties, reinforcing the emotional depth, adding perspective and color, but leaving the center stage to Anker, whose calm presence defines the music. 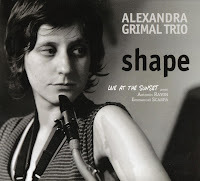 On "Magic Carpet", the long first track, she moves the music from calm, almost contemplative moments to increasing levels of intensity towards the end, but without raising her voice, or without losing the sensitivity, drawing Taborn and Cleaver into her realm of fast little sounds, who echo her, join her, then take over for two consecutive solos, compact, efficient, but great. The equally long second piece starts again in the faintest of modes, with barely audible sax notes vibrating in the air, floating sensitively, encountering their counterparts from the piano and finger-played drums, dancing around each other rhythmically, but then one without recognizable pattern. And out of this almost-silence erupt some gut-wrenching agonizing wails, slowly, plaintively, and then listen how Taborn takes over, capturing the idea, playing around with the implicit rhythm for a wild yet light piano excursion, and when Lotte Anker joins, she moves the piece back to slowness, stretching her notes, laying a quiet blanket on top of the rhythmical frenzy that Cleaver starts creating, followed in that by Taborn, leading to a strange musical contrast between the rhythm section and the tenor, the one hectic, the other slow. The last piece, "Berber", brings again this strange mixture of abstract and deeply emotional music, demonstrating that in the right hands and ears, musical purity in all its polished rawness, in all its real sensitivity, devoid of fake feelings, averse of false pretention, is not a vague dream, but a real possibility. Free form unleashes true feelings. An absolutely stunning performance. Listen to an excerpt from "Magic Carpet"
PS: Some weeks ago I thought that the financial crisis had hit the music industry, because the incoming flow of new music was lessening, as was the quality, but now, I have to revise my opinion. Last week saw some wonderful records being released, and this one is certainly among the highlights.